Just when I think I pretty much know what to expect at certain times and in certain places, I discover that I don’t. It never fails to happen. This Sunday I got to live that lesson again. 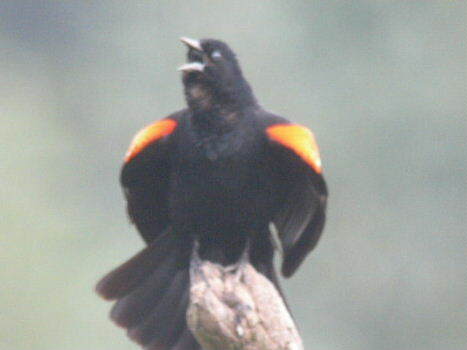 Almost every weekend I look forward to some digiscoping. There is a wetland pond I’ve been going to since May, but the afternoon heat and a general lethargy made me think twice. While lounging in the shade at home, debating about going out into the heat, I had to remind myself that it has always proven to be worth my while to make the effort to put myself into contact with nature. And what the heck, once I got out there with my disiscoping gear I would become immersed into the whole thing, as I always did. Who knows, perhaps I’d get another chance to see a snapping turtle out of the water as I had earlier this year. Sure enough, it was plenty hot out. My face was streaming. Every minute or so I had to wipe my eyes, and precipitation gathered in puddles on the lenses of my glasses. A bright sun made it just about impossible to see through the LCD viewer, while through my scope, the birds wavered in the thick humid haze like camels crossing a desert. 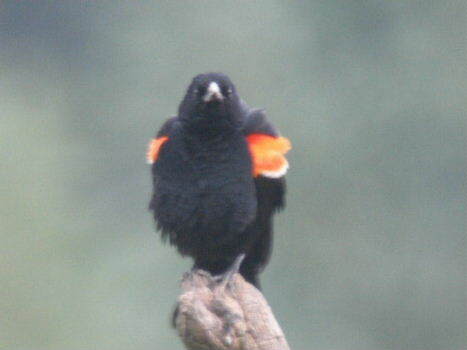 There was a male Red-winged Blackbird perched atop a snag and all in a huff, as he flashed his epaulettes and squawked in outrage. Some Robin-sized birds dipped and swooped for bugs over his head like a swarm of mosquitoes, using the dead tree and its snags as a landing and take off station. There are quite a few Redwings breeding all around the wetland pond area, and while this particular male had been okay with the Tree Swallows that usually fly over the pond, he certainly was not okay with this sudden influx of visitors. I set my scope up, wiped some persperation from my face, and took a look through the eyepiece. Unlike the Redwing, I was pleased to see these birds were part of a visiting flock of Cedar Waxwings. 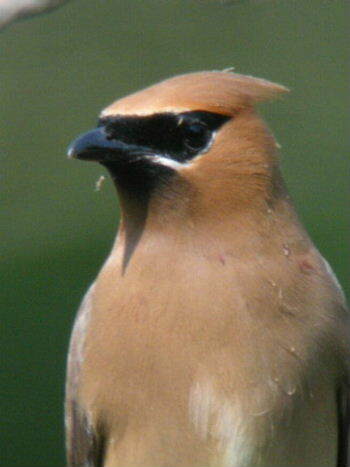 A Cedar Waxwing is different from a Bohemian Waxwing (which is the other type of Waxwing found in the U.S.). The easist way to tell them apart is the yellowish belly on the Cedar Waxwing as opposed to The Bohemian’s grayer underside. Also, the Bohemian has more white and yellow wing markings. Both types of waxwings are nomadic birds that mainly eat fruits and berries. However, in summer bugs make up a good part of their diet. The Red-winged Blackbird had left the dead tree to the Waxwings, who repeatedly landed on the exposed perches and held a pose for awhile before shooting off for more bugs. But even so, the haze and lack of LCD clarity made focusing a challenge for me. There is a focusing tip on Mike’s Digiscoping Blog that suggests turning off the auto focus of the camera and setting it to infinity, then relying on the scope optics to determine the focus, if I understand it correctly. So far I have haven’t managed to get that to work but I believe I may not have completely turned off my auto focus. 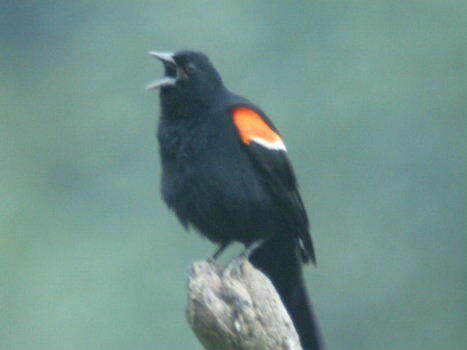 I think I may pay a visit to the Nikon Coolpix P5100 section of Bird Forum. Meanwhile, I was lucky to get a couple of shots that work. By the next day most of the Waxwings had moved on, and while a few remained, that lively swooping and bug-snatching activity of the day before was gone. I thought about how easily I could have missed all of that. There is always something taking place somewhere. There is always some moment out there that may never happen again. Sometimes all it takes is stepping out the door.